You’d think my best memory of Family Day weekend would be the epic Fernie powder. Nope — it was watching Bennett finally link turns as he skied down Meadow, a green run off Deer Chair, following behind Blake with a huge smile on his face. 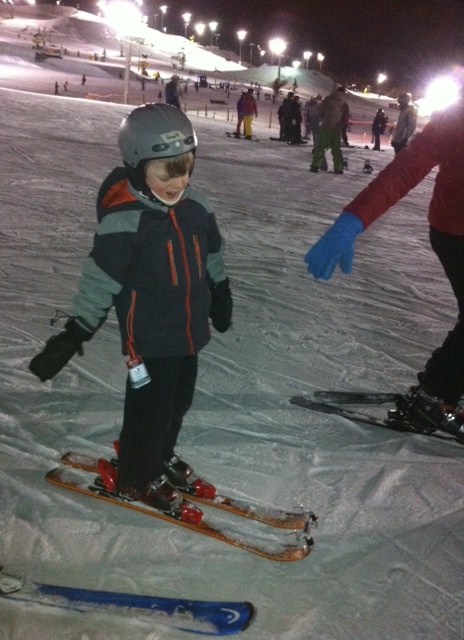 It’s official: the boy can ski. 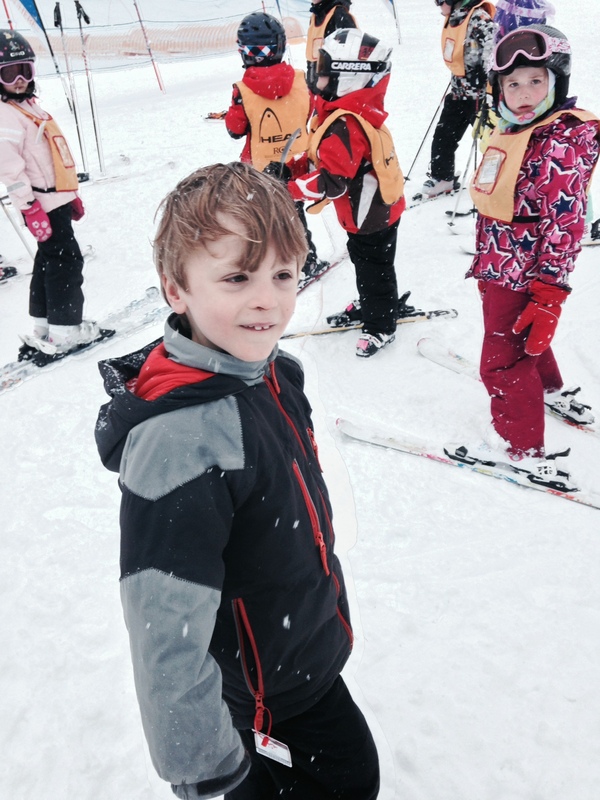 Bennett is excited and proud to be skiing! Photo by Kevin Turner, taken at Fernie. It’s been a long and slippery road getting Bennett on sticks. We began the journey two years ago, by making him put on ski boots and ride the magic carpet. We knew then that we couldn’t rush him into it; that he had neither the strength nor the co-ordination to master the snow plow wedge, or to steer himself, so we bided our time. 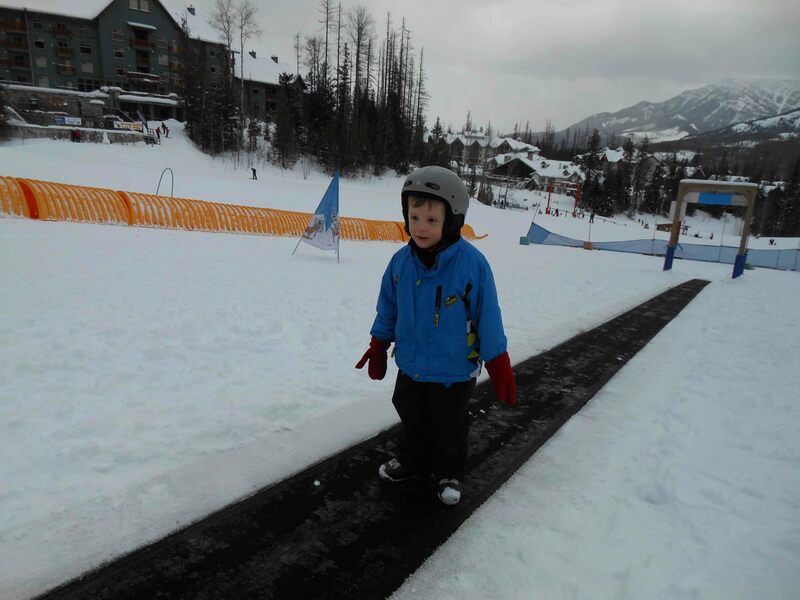 Bennett rides the Mini Moose at Fernie in 2012. “Hmmm, what’s that on the ground?” Bennett wonders, looking every which way but straight ahead in 2013. When your child had a disability it can take a long time for him to learn something that other children master in a day or a week or — as is the case with skiing — a season. Knowing it could take a long time, but committed to the idea of our family being able to ski together one day, we persevered. This year we enrolled Bennett in the Canadian Association for Disabled Skiing (CADS) program that runs over eight weeks at COP and that I wrote about for the Calgary Herald. 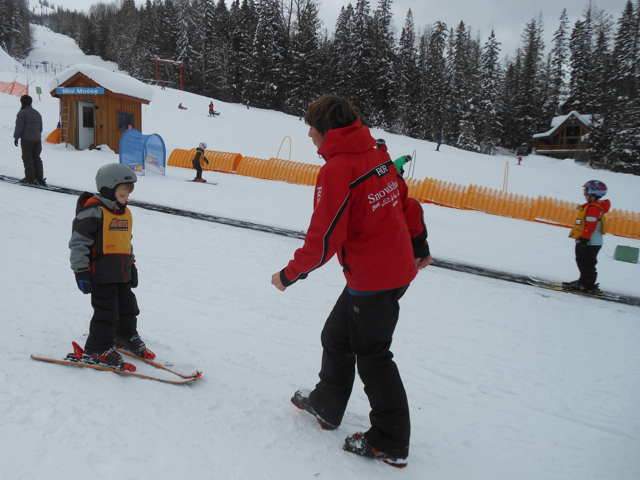 For the past six weeks his volunteer instructors have been getting him out, attaching a ski bra (a.k.a. edge-wedgie, which holds his ski tips together and makes it a lot easier for him to make a snow plow) to his skis’ tips and having him do laps on the magic carpet. After each lesson they would report that he was just going straight down with no pizzas, or he wasn’t into it, or he was too cold. When I snuck out to observe him he was in Lala Land, chewing on his mitten and not paying any attention. “What’s the point of this?” I was beginning to wonder. I felt like I was feeding my dream instead of attending to Bennett’s wishes (namely, to warm up and eat potato chips in the lodge). COP ski lessons with CADS Calgary. So when Blake suggested we take him up the Deer Chair, I thought, “Why not?” With both of us there we could surely intercept him should he go careening out of control toward the trees, another skier or a chairlift tower. But here’s the thing: he maintained a controlled wedge while following behind Blake. He linked his turns. He stayed focused — it was as though needed a longer, more challenging run to stay on task. He even managed quite a long traverse across the slope back to the base. And the best part? Bennett smiled the whole time. Instead of declaring he was “all done,” he wanted to go up Deer Chair again (in itself an exciting journey) and again and again. Forget that powder waiting up in Currie Bowl — I’d rather ski Deer Trail with Bennett. It’s Valentine’s Day — time to toast love! Now, before you uncork a bottle of Piper-Heidsieck to make a champagne cocktail, or shake up a ruby-red High Stick Cosmo, let me win you over with a bitter Heart Day tipple: the Campari Orange Passion. Off-putting at first sip, this bitter-sweet number grows on you after several hearty swallows — kind of like a bad date after three drinks. 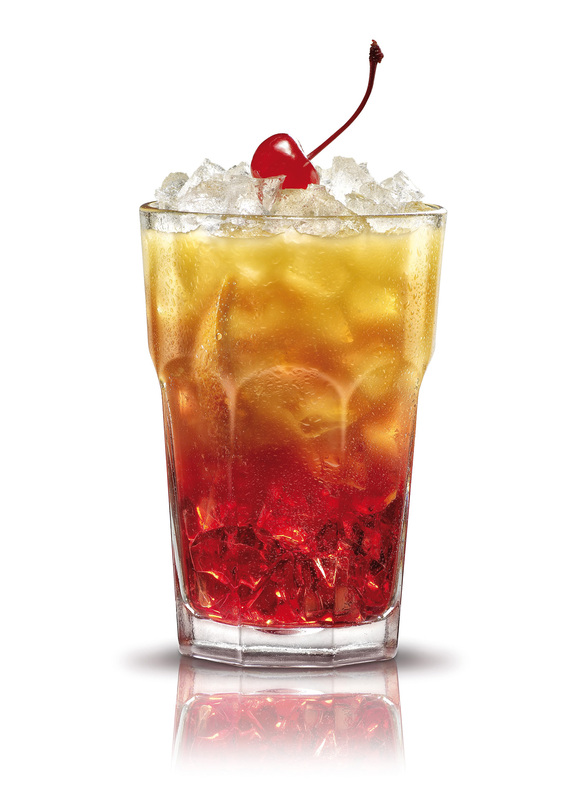 Image courtesy Campari. If you’re thinking, “Why on Earth would I make a bitter, lip-puckering cocktail on February 14th?” please hear me out. For starters, lip puckering usually leads to kissing. Second, the drink’s Campari — a bitter, orange-flavoured Italian aperitif — being somewhat palate-contrary, will have you sipping the drink slowly. This leads to my third point: the cocktail will endear itself to you as the crushed ice melts and dilutes all that bitterness (see photo caption for more). (Confession: as soon as my drink reached the right dilution, I chugalugged it. Oops.) Finally, note the lovely heart-warming hue. Perhaps sensing that the majority of cocktail drinkers aren’t exactly sure what to mix with their Campari, the brand has come out with a cocktail calendar with Campari drink suggestions for every month of the year. The Campari Orange Passion is for February, natch. Prepare the drink in a tall glass. Place orange slices and brown sugar in the glass and crush to a pulp. Add crushed ice. Add the Campari and orange juice and gently stir. Garnish with a red cherry. When I was a teenager and into early adulthood I was a maker of lists. Grocery lists for the store, homework priority lists, bulleted resolutions every New Years Day, and even “Lists of Men” in university (guys I thought were hot, in order of their hotness). Making lists made me feel on top of things and in control during a fairly chaotic time in my life: the transition from child to independent adult. Now that I’m a grown-up I make far fewer lists. I still write down daily work-related tasks like interviews and blocks of time for writing, and about once a month I put effort into the Superstore list, but for the most part, life is so predictable I know what’s coming next and what chores I need to complete so there’s no need to write it all down. The irony is that just as I have become liberated from schedules, Bennett has become a slave to them. We are now the owners of three sets of visual schedules that help our autistic son do everything from choose an activity during free play, to put his pyjamas on at bedtime. The orange strip shows the get-dressed task in order from first (go upstairs) to last (put on socks). Breaking “get dressed” into four separate tasks (underpants, pants, shirt, socks) helps Bennett remember every item and the order they go on. 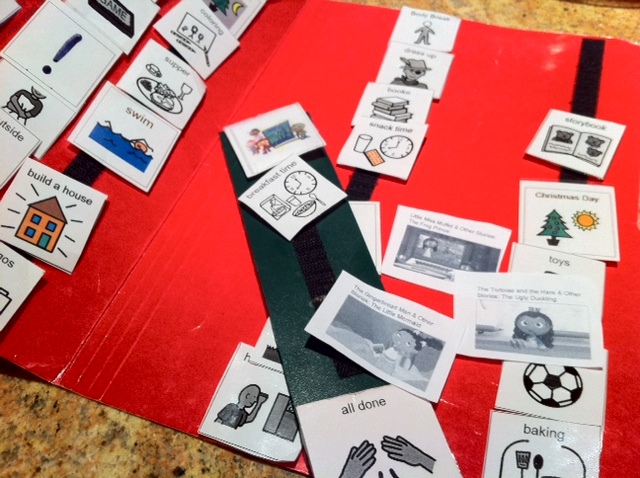 Many kids and adults with autism benefit from visual schedules. These are binders filled with little pictures of things my son might do during the course of the day. The idea is to plot tasks out for him visually on a velcro strip so there won’t be any surprises and to ease transitions between activities. Since he can’t yet read, pictures work best. The idea of the visual schedule was introduced last year when Bennett was in the Specialized Autism Services program through Renfrew, his school. 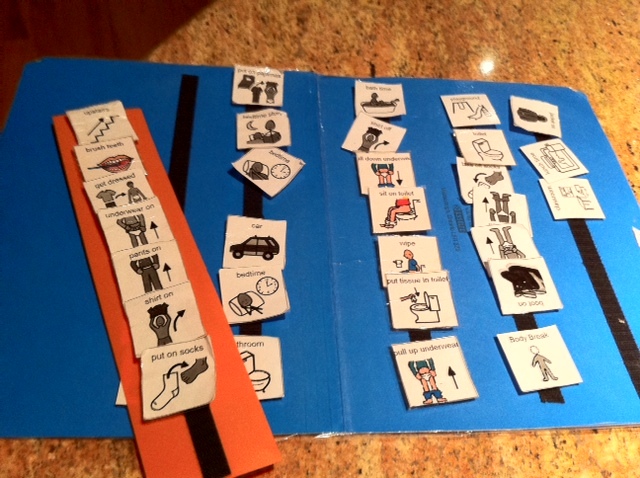 His aides used an activity schedule to direct his play and get him doing things related to the speech, fine motor, gross motor and behaviour goals in his Individual Program Plan. The teachers at his school also use them in the classroom. You can’t just tell Bennett, “Now we’re going to do a craft,” because he’ll say, “No, I don’t want to.” But if you show him a schedule with the craft icon, he’ll do it. The schedule was like gospel. Bennett brushes his teeth on cue from the schedule. 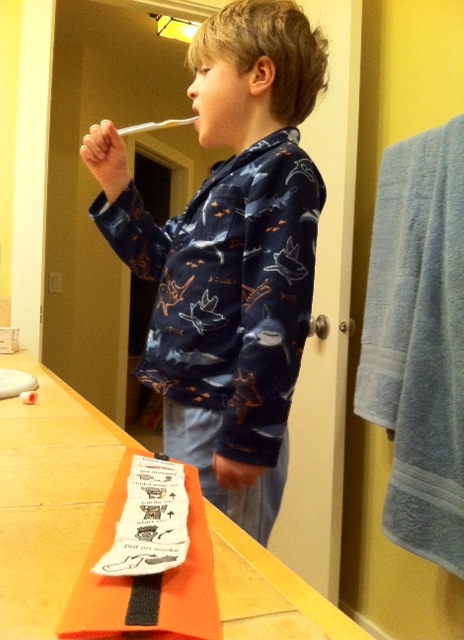 I started using one in the mornings for getting dressed, and in the evenings for bedtime, to motivate him to brush his teeth, put on his pants, etc., without having to constantly nag him. With the schedule to refer to, he knew what was expected of him. Happy, happy, joy, joy, right? Well, kind of, sort of, not really. Life under the rule of Bennett’s schedule is constricting. The older he gets, the more he gets set in his ways. We are now at the mercy of, and rely on, the schedules. They really are like gospel in that if we don’t follow them, behaviour hell breaks loose. For example, Bennett is currently obsessed with the cartoon Super Why. In the fall he got in the habit of watching Super Why once in the morning and again before dinner. The problem was he would watch only the same two episodes over and over again. I could suggest different episodes, but no. Following the advice of his school psychologist I finally resorted to creating a Super Why schedule. I printed off images that represent every episode of Super Why and I cut them out into little schedule squares. Now, I give him two different Super Why choices to choose between. The strategy worked to get him watching different episodes, but I fear he’ll be watching Super Why FOREVER (case in point: he wants to go as Whyatt from Super Why for Halloween, a holiday that’s eight months away!). If there’s no Super Why, if for some ungodly reason Netflix is NOT WORKING, Bennett turns into Linda Blair from The Exorcist. Yes, we now have a schedule exclusively for Super Why. But for Bennett at home, these routines and rituals are a life-saver. I can’t imagine what it must be like to be inside his brain. I think that to him, the world must be a confusing, overwhelming place filled with words, body language and nuance he just doesn’t understand. I sometimes think that when I open my mouth and tell him a bunch of stuff all at once, he hears the woman from the Charlie Brown telephone, “Wha-wha-wha-wha-wha-wha…” So those simple pictures on a velcro strip translate the hieroglyphics of the spoken word into commands he can understand. Like my adolescent and young adult lists, Bennett’s visual schedules bring order to his world. Let’s be honest though. Vodka is vodka, right? 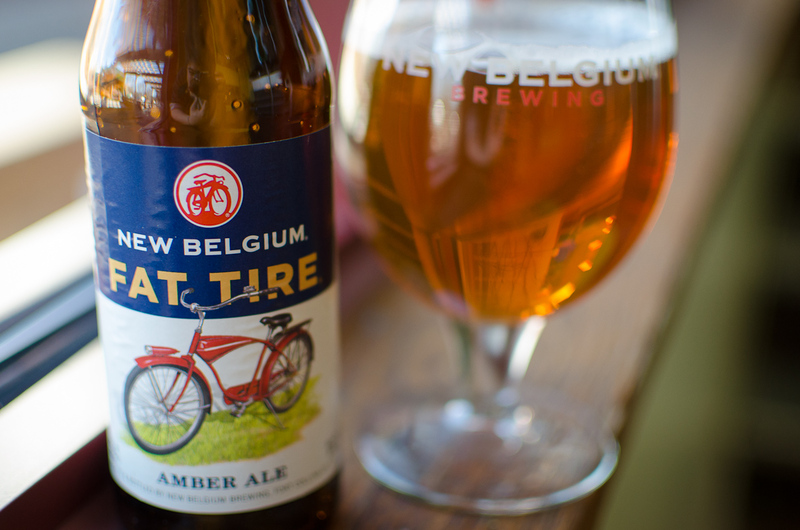 It may be made from all-natural ingredients and filtered 18 times (!) in an artisan distillery, but the reason we’re going to buy High Stick Vodka is because we’re Canadian and it comes in an almost life-size glass hockey stick. It’s freakin’ cool. 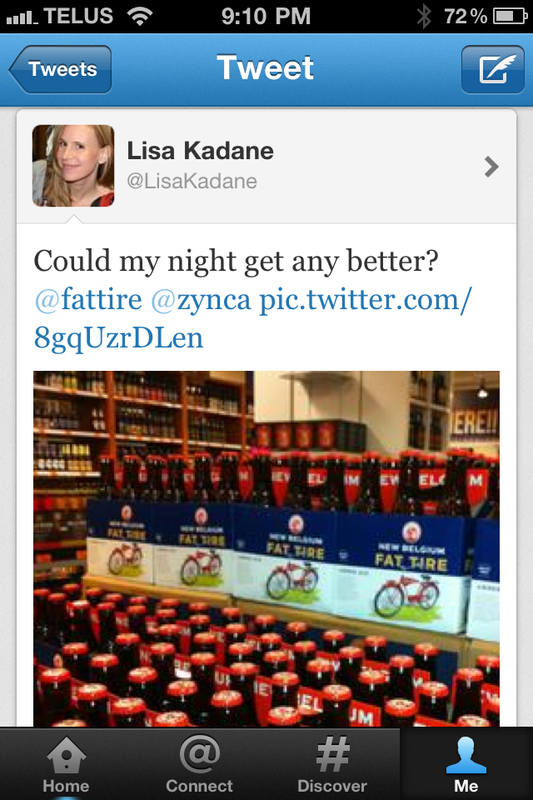 In fact, it’s “mount as the centrepiece on the top shelf of my home bar” cool. Or, “throw an Olympics bash and do shooters from the end of the hockey stick” cool. 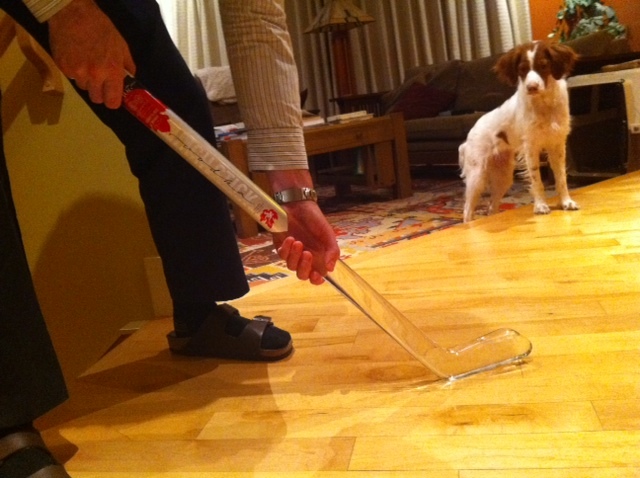 Forget about that other vodka in the skull — this one comes in a hockey stick!! A Cosmo is tasty, and red. Important considerations when cheering on Team Canada at the Olympics. In a cocktail shaker filled with ice combine all ingredients and shake. 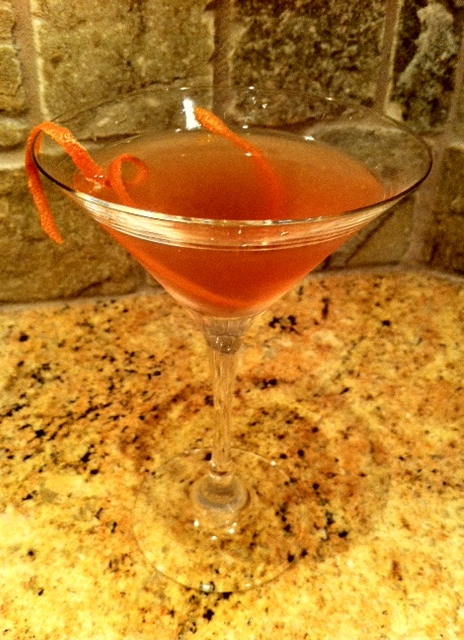 Fine strain into a chilled martini glass and garnish with the orange twist.